If you look through the baby/parenting section at any bookstore you will find numerous books dedicated to care and development of babies. 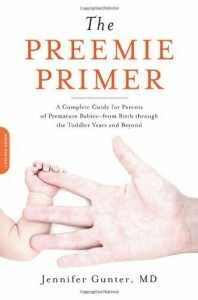 However, you’ll find very few ‘handbooks’ for parents of premature children and none as complete as The Preemie Primer. This book covers all aspects of preemie care from birth and the NICU (neonatal intensive-care unit) through to childhood and what to expect in the later years. Author Dr. Jennifer Gunter, renowned OB/GYN and a mother of premature babies, shares very personal experiences while guiding you through the medical terminology, procedures and system related to preemie care. Dr Gunter not only has an extensive background in the medical field, delivering hundreds of premature babies throughout her career, she also has firsthand experience having preterm labour herself at 22 ½ weeks, sadly losing her first born triplet and giving birth to the other two at an early gestational age of 26 weeks. The great thing about this book is that the author shares her innermost thoughts and feelings surrounding the birth of her children and the years that follow in a way that makes you feel like you are one of her dearest friends. Personal accounts of her boys’ medical ups and downs are spread throughout the book, adding a genuine personal touch. Dr. Gunter explains how she felt overwhelmed in the NICU and how she could imagine how parents without a medical background would feel. The book talks about the defining moment when she realized she had the home court advantage and knew she had to use her resources and knowledge to help her babies get the best chance at life. This advantage is also used through the writing of this book to help other parents empower themselves to become advocates for their children. While reading the Preemie Primer someone asked me if parents of a premature baby would have the time or energy to read this book while in the NICU. My answer “Absolutely! They couldn’t afford not to”. Having spent time in the NICU with both of my boys, I know how stressful and confusing it can be and that there is a strong need for answers. This book would alleviate at least the stress of the unknown and actually help empower parents to become the strong and crucial link in their child’s medical care team. It was an honour to read this brilliant book chock full of understandable medical information and compassionate advice from a mom who has been there.